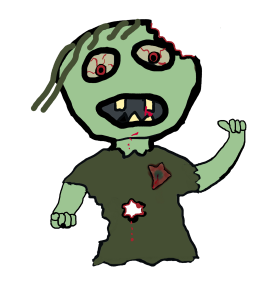 This page will tell you how drawing a zombie stick figure might one day save your life. There are many factual documentaries and articles on the internet about outbreaks of zombies and how these flesh-eating killers are a menace to society. In a typical scenario a family house can be surrounded by them. The phone lines are down, radio silent, gas station empty and no one to help. At any moment they will break down the door and do bad things to your person. In the Hollywood films they show the hero - that's you in this scenario - arming themselves and bashing zombie heads. Then the hero is overwhelmed by the mass of numbers and dies a heroic death, having saved the fit looking girl. I don't want to die any sort of heroic death. I would prefer a fleeing related activity with a chance of escape from these slow-moving maniacs. Real life doesn't work like that. You are stuck in your house seeking help and the only thing you have to hand are a few coloured pencils, paper and a carrier pigeon. If you could draw some quick pictures of the zombies and send them off on the pigeon, someone might get the message and rescue you. First thing is to check it really is a zombie. There are a number of clues in the picture. The hideous injury is a dead give away. No mortal could survive such a thing - it clearly indicates that this is a living dead type of person. Although zombies are people who have come back from the dead - none of those who die peacefully in their sleep appear to return. No. It is only those who had been killed in terrible accidents who are now reborn and despite their good fortune want to kill you. The figure covers most of what a zombie needs. Blood, injury, a missing limb is great, and sometimes a beetle or bug crawling about. The weapon shows that he has not come into your front garden for peaceful purposes. Tip. If the zombies confronting you are not as gruesome as the one in the picture it is best to dress it up a bit if you want the police to come quickly. One slightly injured person who might not be a zombie will not cut it. To get an instant result from your carrier pigeon mission you need to impress upon the emergency services the number of fearsome zombies hammering at your door. Drawing groups of these terrifying people is not as easy as it seems. For example, this picture shows what looks like a cheap remake of Thriller. While that is mildly humorous and would give the hard-pressed armed forces some much needed light relief - it does not convey the imminent threat to your life and limb that they pose. In the window picture - and remember I am under some pressure here because there are hordes of zombies trying to get in through the window - I have used elements of art and perspective to create a disturbingly lifelike scenario. It is worth noting that a high-quality double glazed window will prove its worth in any type of massed horde zombie situation. "I should have bought better glazing" is one last thought you do not want going through what remains of your brain. If you are going to draw pictures of zombies you need to make sure they can't escape. A picture will need a sturdy frame to keep them inside. Even then the zombie stickmen will try to get away. Once they are out it is difficult to get them back in again. That was a bit of surreal nonsense for humour purposes. When facing a terrible death it is good to maintain a misjudged sense of positivity. Having drawn some excellent depictions of zombie threat it is time to send your message by pigeon. As mentioned at the beginning of this excellent article you must have at least one pigeon to carry out this task. ​As a keen pigeon fancier before the world wide crisis you will hopefully have a number to choose from. Choose your best and most trusted bird unless the zombies have already got to him. Having sent your pigeon off with the message (you did remember to attach the message?) - it is time to relax. Although the zombies will be trying to break in, intent on eating your arms off and making you into one of them, you should take your mind off it. Playing music will drown out low-level screaming and moaning, and a high-energy snack will maintain energy levels. It is important to keep your bowels regular although you may have less trouble going than stopping. Locating tools and kitchen equipment for fighting them off in a hopeless but vaguely heroic manner might be worthwhile - especially if you have an attractive girlfriend you want to impress. Never try to use the tools. Simply collect them with a can-do attitude and play for time. If you have a less attractive girlfriend try to keep her between you and the front door in case they break in before help arrives. Your pigeon and pictures should be received quickly at the National Guard headquarters who will despatch a helicopter to your address within seconds. You did put your address on I hope? A "No zombies" sign may prevent an attack. Theory yet to be tested. The artist Mark Ewbie has not yet finished what will surely be a most impressive collection of stick zombie pictures on this page. He is temporarily indisposed at present having failed to turn up at a recent award presentation. Although he lives way out in the back of beyond, where there have been reports of strange disturbances, and his phone seems to be out of order - we are sure there is no cause for concern. We engaged the so-called humorous internet writer Mark Ewbie in good faith, hoping that he could liven up some of our output which is on the dry side, and enable us to reach a wider youth audience with important Zombie related information. His first and only article for us contains dangerously misleading advice regarding the possible use of a pigeon for messaging in the event of a zombie outbreak. At the Department we pride ourselves on testing advice before instructing the public. We hired a pigeon consultant for a fortnight at a cost of some five thousand dollars to test the theory. He concluded it was useless. Pigeons fly home. They do not fly to other places despite any threats you employ. That is why they are called homing pigeons. The normal method for emergency communication is to take the pigeon to the scene of disaster and release it to fly home. When we released our pigeon with a test message it flew out of the window and straight back in again, expecting a treat of some sort. We tried attacking it with a broom as it flew back in but this made the pigeon sad. It did not fly anywhere else. It sat on the window-ledge until we put the broom away. One of our operatives suggested shooting at the pigeon to scare it away and we killed four birds with no dimming of their homing instinct apart from being dead. After these in-depth trials we have concluded that the author of this article is a misleading conman who should on no account be listened to.